Please excuse the open letter but we have been trying to contact you for some time. 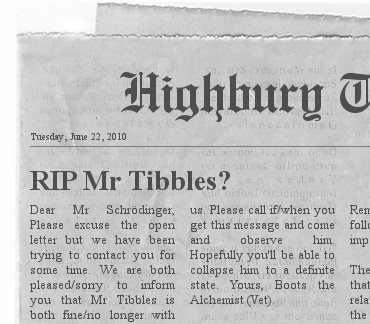 We are both pleased/sorry to inform you that Mr Tibbles is both fine/no longer with us. Please call if/when you get this message and come and observe him. Hopefully you'll be able to collapse him to a definite state. Yours, Boots the Alchemist (Vet).